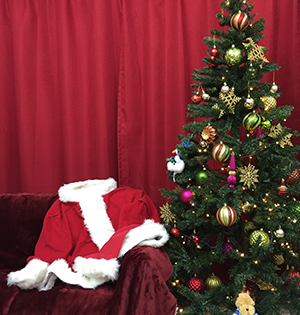 Come and join us at “Christmas Party for Kids & Parents!”. Meet up with families from Japan and different countries in a fun and friendly atmosphere, and enjoy the opportunity to have cultural exchanges. 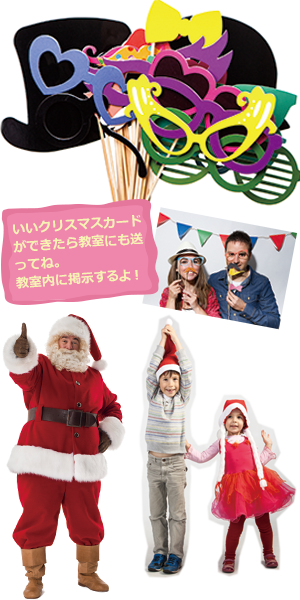 You can take many photos with Santa Clause and funny props, and use them for your Christmas greeting cards! We may divide participants into some groups. Let us know the name of your companions not to be divided into different groups. We may add other events if we have many entries. Please watch our website or SNS to get latest information. Take memorable photographs with colorful backgrounds! There are many funny props, and you can use them for your Christmas greeting cards. We’ll prepare 3 kinds of backgrounds. You can take photos by your own cameras and smartphones. Please send your best Christmas greeting card to our school. We’ll display it in our classroom for a while. Let’s enjoy playing many games with our teachers! There are many types of games from physical activities to card games. All ages of children can enjoy them. Copyright © eigomura.jp★こども英語村 All rights reserved.